Aloha and welcome to the leasing website for the Iikai Shops! Soaring to 30 stories with its stunning glass elevator, the 1009-unit Ilikai is one of Honolulu’s iconic properties. Developed by the legendary Chinn Ho, the Ilikai features the work of John Graham, architect of Seattle's Space Needle and was featured prominently in the opening sequences of the television series "Hawaii Five-0" which aired from 1968 - 1980. The Ilikai is also known for its rooftop restaurant - the award winning Sarento’s Top of the “I” – offering superb regional Italian cuisine with a Mediterranean flair. The Ilikai Shops is strategically located within walking distance of Waikiki's most densely populated residential population. 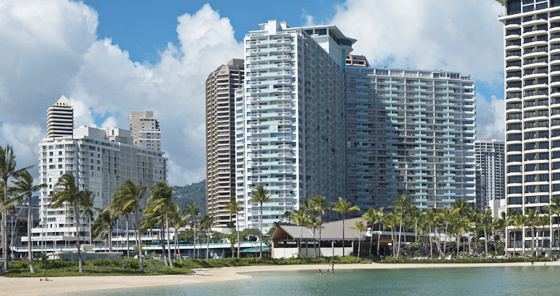 Situated at the entrance of Waikiki, the property is nicely sandwiched amongst the Prince Waikiki Hotel, The Modern Honolulu, and the newest Hilton Hawaiian Village timeshare tower, the Grand Waikikian.